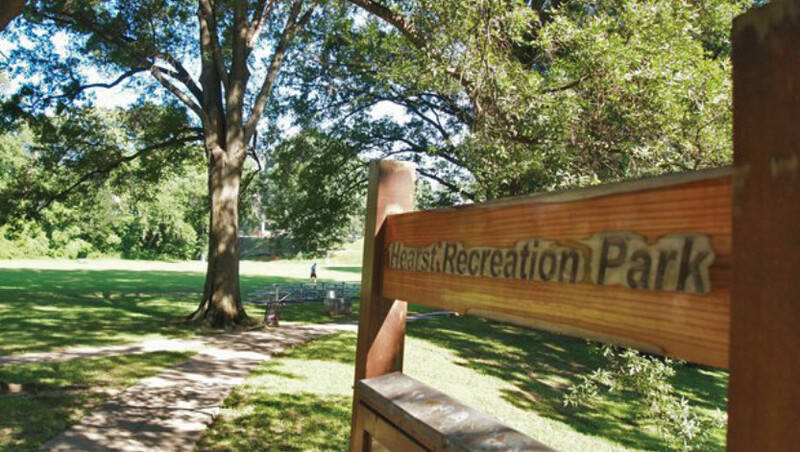 The District of Columbia’s Department of Parks and Recreation (DPR) and Department of General Services (DGS) have commenced the formal community outreach and design phase for the Hearst Recreation Center (known as Hearst Park). 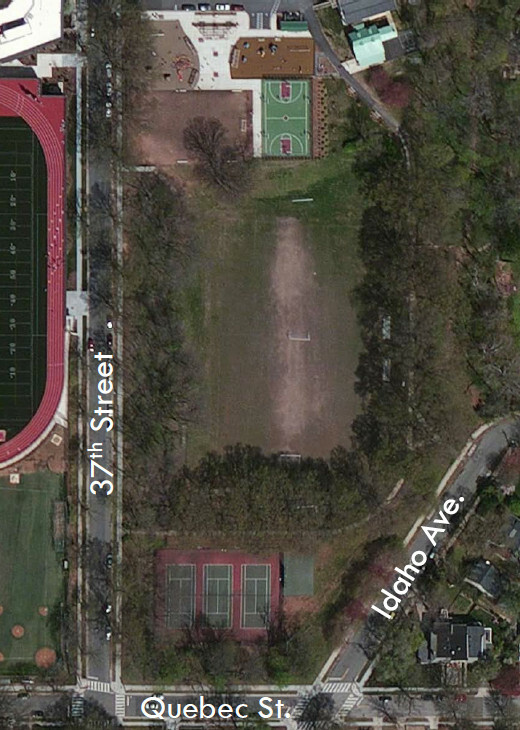 The park is bounded by Hearst Elementary to the north, Quebec Street, NW to the south, 37th Street on the west side and Idaho Ave, NW on the east. An aerial view of Hearst Park, from the May 10th presentation. The “Hearst Campus” – including the recently renovated and expanded elementary school (a great success story that evolved with community input) and the upper playground and artificial turf soccer field – continues to evolve and now our community and the city have the opportunity to influence this jewel of a park. As evidenced at the May 10th meeting, there are a variety of park attributes that neighbors seek and many who also seek to “protect the trees” and the associated green space. The DPR/DGS/architectural team was made aware of certain concerns including a full opportunity to evaluate various park design options (e.g. the location of a possible swimming pool and attached pool house), address street traffic and parking in light of other developments in the area, opportunities to use the amenities year round, and the critical need to address the Hearst recreation cottage that serves school children and the community. The DPR/DGS/architectural team plans to conduct several community-based design input sessions in the coming months to address the opportunities and concerns noted above, along with others the community brings forward. At the May 17th ANC 3F meeting, DGS Community Outreach Coordinator Jackie Stanley said the community will lead the design process. “We have not designed the park or the pool,” she said. “We come empty-handed” to the first community design meeting. That meeting, Stanley said, will take place the first or second week in June. Announcements will be posted in the community listservs and via Forest Hills Connection. The team also plans to inform the public through periodic updates to the DGS website where city-wide construction projects are listed – see dgs.dc.gov/node/1135096 for Hearst Park. I hope the neighbors are open to the idea of a pool. We could really use an outdoor pool in the neighborhood. It would be a shame if it were shouted down for NIMBY issues. There isn’t another place one could logically go in the area. Overlooking the Meer at the top of Central Park, this free, public pool can accommodate a whopping 1,824 people at a time in the summer, when neighborhood kids and tourists alike queue up along Central Park North to get in and cannonball. Then, once the lifeguards go off duty after Labor Day, Lasker transforms into a full-fledged ice-skating rink for the winter. (Unlike to swim, there’s a small fee to ice skate, but the crowds remain constant anyway.) Park programs, too, span the seasons, so the summer brings free swim lessons for kids, while adult pick-up ice-hockey leagues start up when the temperature drops.